So there are a lot of yogä "experts"these days offering to make your blocked chakras flow. This is an extremely tricky place. Very few masters will proudly discuss their intuitive understanding of something like the chakras. More evolved masters than these Johnny-come-lately types refuse to discuss this esoteric topic simply because it is not for the ordinary people. For instance, you know you have a heart. You may even read up all about its physical shape and where it is and what its functions are and its diseases. But will you cut it open and prod it about trying to find out if it is working optimally or not? That is the sort of ridiculous things that are being offered these days into something you really do not want to mess it! 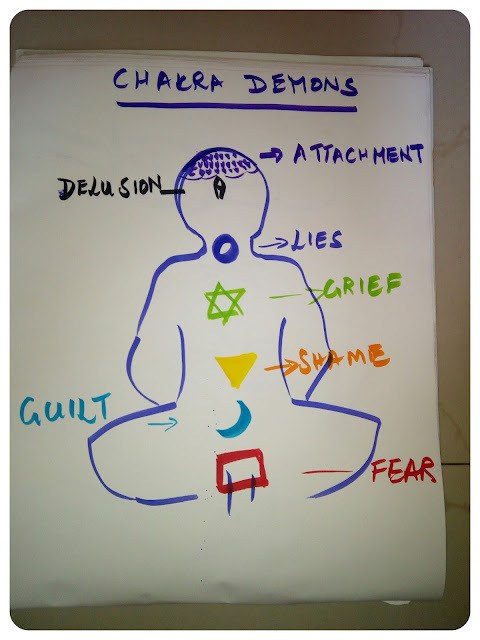 Above I have listed the real demons of having a overflowing chakra. Reading it should give you enough reasons not to want to make any chakra overflow. The key phrase everybody, including the charlatans are missing, is "balancing the chakras". A steady practice will clear your nadis, energy channels. When their pathways are clear, the chakras will balance themselves out. Do not opt for short cut "chakra operations." Invest in a strong practice, instead.